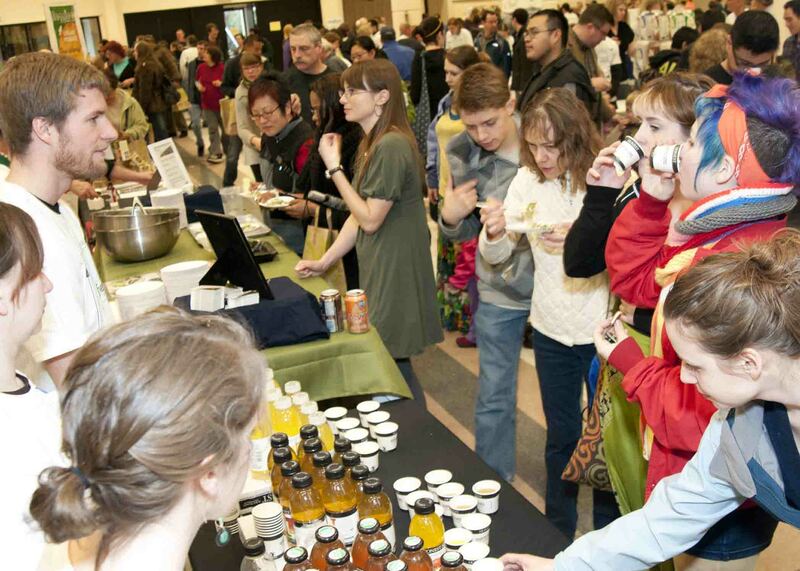 The eighteenth annual Vegfest was held on March 30 & 31, 2019. Vegfest is an amazing event where many people discovered how great vegetarian food can taste, and how much it can help. Our biggest event of the year, Vegfest, is coming up on March 24th and 25th at the Seattle Center Exhibition Hall. People coming for the first time are sometimes overwhelmed by the abundance of food choices and learning opportunities available to them, so our recommendation is to plan ahead. Food sampling at Vegfest is always one of the most popular parts of the event, and with over 500 different kinds of food to try, we’re sure you’ll find plenty you’ll like and discover more new products each year. Because there’s so much to sample at Vegfest, the trick is remembering it all! So we suggest having a memo book with you when going up and down the aisles. That way you can write down not only the names of new foods you’ve tried, such as the latest dairy-free “cheddar,” and also the different flavors and varieties of familiar foods used in new ways, such as Japanese style silken tofu stir-fried in a Tex-Mex sauce. You can also jot down details, such as which local stores carry the product, and other varieties and flavors of the product that are available. You can also use your cellphone camera to take a quick picture of each product you like, so that you’ll have an instant record of the packaging when you get home. Bargain hunters should be on the lookout for coupons throughout the weekend, and be sure not to miss our Sunday night closing sale, when all the remaining food is available than bargain prices. Involve the kids! Most kids are notoriously picky eaters and this is a great time to find out what they really like, and are willing to eat, without spending an arm and a leg. It’s also a great time for them to learn and to form healthy food habits. We suggest attending our free “Eat a Rainbow Everyday” skit put on by our favorite clowns Zero and Somebuddy twice each day! Vegfest features a powerhouse of medical doctors, each one an expert on the connection between health and nutrition. Our keynote speaker this year is Dr. Neal Barnard, president of the Physicians Committee for Responsible Medicine, and author of at least 14 books on health and nutrition. Check the online schedule before you come, to time your visit to coincide with the speakers who best address your particular needs. With so many doctors speaking, this is a golden opportunity to get your questions answered. Don’t be shy! We suggest writing down your questions in advance, and then asking them just after each doctor gives their presentation. That’s the time that our presenters are expecting lots of questions. Make sure to have notepaper with you during their presentation as well, so you can ask about anything new you just learned about. Vegfest is a booklover’s bonanza, and another great way to learn more about the many benefits of a vegetarian diet, and how to cook delicious food! To save a few dollars look for so called “hurt books”. These books merely have a creased cover or a few pen marks but sell at steep discounts. However, perhaps the most fulfilling part of the Vegfest experience is actually joining Vegetarians of Washington, the non profit that produces Vegfest each year. While you can always join or renew at any time of year, if you join at Vegfest you’ll receive the added benefit of our membership bag – a free tote bag filled with lots of free food and valuable coupons.